Tehran, we were warned, would be characterless. It was. There was no heart to the town which seemed like a lot of villages which had spread and amalgamated into an amorphous mass. I remember endless streets that all looked the same as we went from one museum to another. The main one for antiquities was formidable, but vast and tiring. Not enough places to sit down and ponder all we had seen. A very formal garden almost choked in colour in front of a small villa with mirrors, strangely reminiscent of the Taj Mahal, was a hidden delight. The verges and divisions between streets had bright green lawns, meticulously mown and planted with shrubs, probably tended by some of those adults who, we were told, were given $40 (a month?) as their share of the petrol bonanza. Our hotel with thirty or more floors was so consciously up-to-date that it will soon be out of fashion. It towered over the city. I was glad to leave with the few of us who wanted to travel further north towards Russia. The weather changed as did the countryside. We drove under leaden skies through apricot orchards in blossom and ploughed fields that curved up to the stone-strewn highlands. No more green verges mown to perfection. Apparently the Shah had started this in the cities we had visited. From Shiraz to Yazd, Isfahan to Tehran, the cities were on show for tourists. Now we were now in the real Iran, the more fertile northern provinces. Our hotel on the shore of the grey Caspian Sea was deserted. It was too early in the spring for Tehran’s citizens to go to the seaside. Ours, a perfect relic from the 1950s, was deserted. Just us. We drove further north along the border with Russia – high wire fences and barbed wire. It is a mountainous region with deciduous forests and a few stone villages by racing torrents. 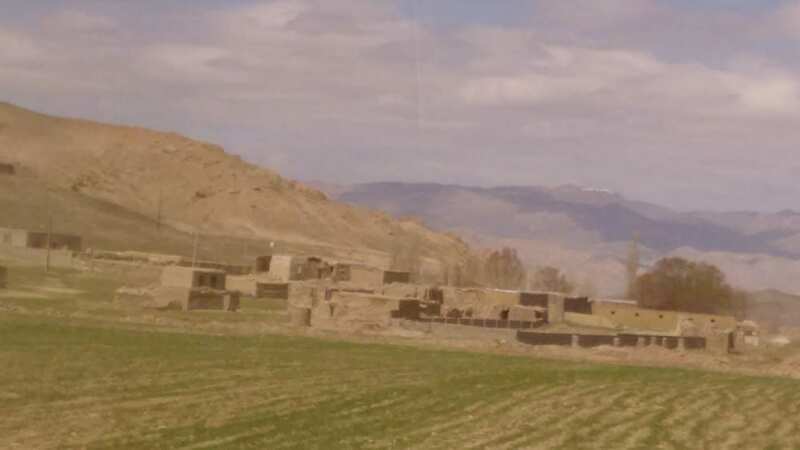 The lowland farming settlements all seemed to be of concrete or mud bricks, one storey only, which is wise in an earthquake area. They might sometimes be shared with cattle, but we sped rapidly past and couldn’t be sure. Our last hotel in Tabriz, like the one in Tehran, overlooked the city, but that was good for communications. My lasting memories of this city of a mosque, shattered in an earthquake, being meticulously pieced together, of some shrines of holy men in the past, and the only time where the sad photographs of the martyrs of the Iran-Iraq war that are attached to lamp-posts in the city centres included Christians on a large board by a monastery. 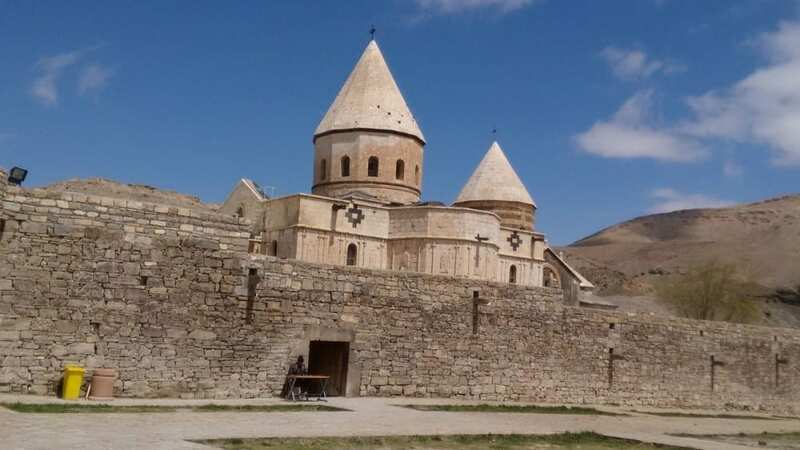 We travelled to the north near Samarkand, almost to the Russian border, to a remote Armenian monastery at the foot of Mount Ararat where the ark is said to have touched land after the Flood. The church is dedicated to Saint Gregory and is the focal point of an immense pilgrimage in the summer. Huge courtyards welcome the pilgrims though the church itself is small. Under sharp blue skies a wind howled. We were bitterly cold, the only visitors, watched by a few shepherds and their small flocks scattered among the rocks in the vast, mountainous landscape which had witnessed invading hordes for centuries. To the north, Russia, and Turkey to the west. All sounds a bit sad and despondent Valerie. Next time you must take a folding stool or sitting stick. I hope you gleaned more knowledge from the museums you visited. Yes, the museum and also the museum houses were illuminating, and the gardens joyful. Yes, Sandra, I heard that about Iran, but no one in Europe lives in a theocracy now, thank goodness..